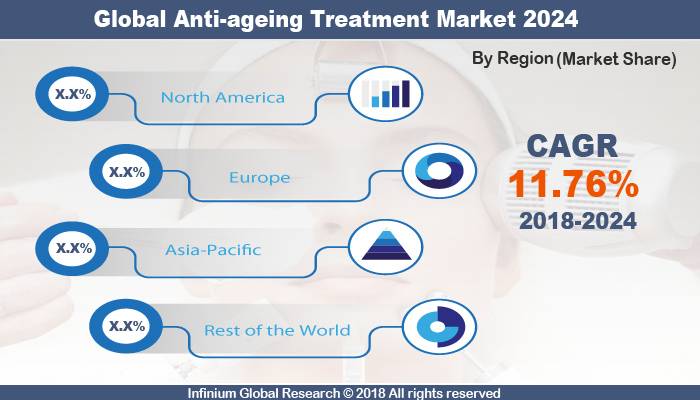 A recent report published by Infinium Global Research on anti-ageing treatment market provides in depth analysis of segments and sub-segments in global as well as regional anti-ageing treatment market. The study also highlights the impact of drivers, restraints and macro indicators on the global and regional anti-ageing treatment market over the short term as well as long term. The report is a comprehensive presentation of trends, forecast and dollar values of global anti-ageing treatment market. According to report the global anti-ageing treatment market is projected to grow at a CAGR of 11.76% over the forecast period of 2018-2024. The anti-ageing treatment are used to boost the regeneration of the cell and to increase the blood flow that helps top reduce the effect of aging on skin. The increasing appearance of dark spots on the skin, lines & wrinkles, sagging skin, dullness, and patchy skin are signs of aging. The different treatment are available in the market to treat signs of aging. Anti-wrinkle treatment, anti-stretch treatment, acne treatment, anti-pigmentation, liposuction service, abdominoplasty, chemical peel, eyelid surgery, sclerotherapy and hair restoration are the treatments used to slow down the process of aging. The laser therapy are used to correct textural irregularities, dull tone of face. To remove the dead and damaged layers of skin and reduces acne and rough facial skin texture, pigmentation, deep wrinkles chemical peel treatment is used. The anti-ageing treatments are mainly done by the beauty experts and dermatologist in clinics, hospitals, luxury salons and spa centers. Growing awareness among customers regarding personal care and the different treatment for healthy and good appearance is likely to boost the growth of the market. Additionally, the rise in the per capita income and change in lifestyle is another factor that propel the growth in this market. Moreover, innovations and development in anti-aging treatment and their enhanced effectiveness is likely to drive the market in the coming years. On the other hand, the side effect of the treatment such as redness, irritation and cystic acne and high cost of the treatments is likely to hamper the growth of the market. Increasing stress and the environmental pollution also boost the skin aging, thus research and development for new treatments will bring more opportunities to the market in the coming years. Furthermore, leading companies are focusing in providing innovative technologies for the anti-aging treatment. Among the regions, North America is expected to be the largest market for anti-ageing treatment. The rising of aging population and new technological advancement in anti-aging treatment is driving the growth in this region. The U.S. dominate the anti-aging treatment market in North America. The change in lifestyle, increasing per capita income and rising awareness about personal care and beauty treatments is likely drive the growth of Asia-Pacific region. China is the major contributor for the fast growth in this region. The innovation and technology advancement are the strategies of the leading player to retain their position in the market. For instance, Samsung has launched S Skin, a concept that analyze the conditions of skin with the help of cameras, photo sensors, and conductivity sensors. It also recommends how to improve the skin along with skin therapy by integrating micro-needle patches which contain crucial skincare products like collagen. The report on global anti-ageing treatment market covers segments such as, treatment type, end user and distribution channel. On the basis of treatment type the global anti-ageing treatment market is categorized into anti-wrinkle treatment, anti-stretch treatment, acne treatment, anti-pigmentation, liposuction service, abdominoplasty, chemical peel, eyelid surgery, sclerotherapy and hair restoration. On the basis of end user the global anti-ageing treatment market is categorized into below 25 years, between 25 and 40 and 40 years and above. On the basis of distribution channel the global anti-ageing treatment market is categorized into luxury salons and spas, hospitals and clinics and others. The report provides profiles of the companies in the global anti-ageing treatment market such as, Photomedex Inc, Beiersdorf AG, Lumenis Ltd, Alma Lasers Ltd, Personal Microderm, Cynosure Inc, Coty Inc, Solta Medical Inc, L’Oreal SA and Allergan Inc. The report provides deep insights on demand forecasts, market trends and micro and macro indicators. In addition, this report provides insights on the factors that are driving and restraining the global anti-ageing treatment market. Moreover, IGR-Growth Matrix analysis given in the report brings an insight on the investment areas that existing or new market players can consider. The report provides insights into the market using analytical tools such as Porter's five forces analysis and DRO analysis of anti-ageing treatment market. Moreover, the study highlights current market trends and provides forecast from 2018-2024. We also have highlighted future trends in the anti-ageing treatment market that will impact the demand during the forecast period. Moreover, the competitive analysis given in each regional market brings an insight on the market share of the leading players. This report will help manufacturers, suppliers and distributors of the anti-ageing treatment market to understand the present and future trends in this market and formulate their strategies accordingly.